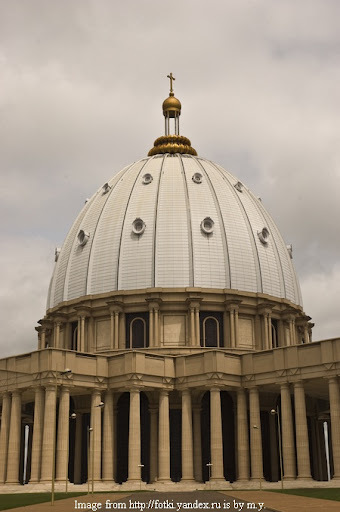 The Basilica of Our Lady of Peace, Yamoussoukro, Côte d'Ivoire was completed in 1989 at a cost of US $300 million. It was consecrated on September 10, 1990, by Pope John Paul II. 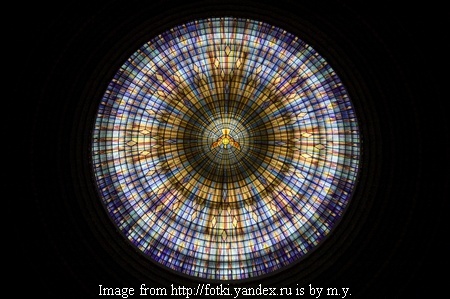 The design of its dome is inspired by the Basilica of Saint Peter in the Vatican City, although it is not a replica. While designing it after the Vatican Basilica, architect Pierre Fakhoury constructed the dome to be slightly lower than the Basilica of Saint Peter, but ornamented it with a larger cross on top. The finished height is 158 meters. The basilica is constructed with marble imported from Italy and is furnished with 7,000 square meters of contemporary stained glass from France. There is enough space to seat 7,000 people in the nave, with standing room for an additional 11,000 people. As per http://www.churchesguide.com "There is debate over whether the Vatican's St Peter's Basilica is larger, however Yamoussoukro holds the record according to the Guinness World Records which lists it as the largest church in the world, having surpassed the previous record holder, St. Peter's Basilica, upon completion." Built at a cost of USD 300 million, many people are of the opinion that such a lavish expenditure, reportedly twice the national debt, was gross waste of public money, which could have been better utilised in the poor country like Ivory Coast. Image from http://fotki.yandex.ru is by m.y. as u said that the Guinness book calls it """the LaRgEsT church in the world, having surpassed the previous record holder, St. Peter's Basilica, upon completion.""" In this, in what point it is LARGEST?????? Congrgation or area or height or what????????? ?